While most rooms have some sort of closet, there is so little conversation about what color to paint these useful spaces. Since they each have varying degrees of visibility, there are many different options to consider with color choices. While there are no rules for these areas, here are some general guidelines you can consider for the closets in your home. Closets come in all shapes and sizes. Many homes have a coat closet in the entry way to hang their jackets and coats, and those that belong to guests. This is one that more people will see than inside your linen or cleaning supply closet, which usually has a closing hinged door. Most interior designers will tell you to just paint the inside of these closets the same color as the surrounding walls. If the closet is especially dark or in a poorly lit area, using a lighter version of the surrounding color is a great way to add a little variety and brighten the space. If you want a more dramatic feel, you can always add a light, neutral color that complements the rest of the room. The same as the bedroom. This gives the entire master suite a more cohesive feel. A complementary color. While keeping the room still in the same color palette, the room is still a part of the suite’s overall feeling, but still a separate space. Neutral light color. This option is most ideal for a walk-in closet that does not have any windows. This allows the room to feel bigger, but also increases the visibility in the space. The color in these big closets matter and will change how you feel in the space. Another thing to consider is what the closet is used for. Since these spaces are so handy for storage, there are all kinds of directions you can go with color choices. Three good examples are storage closets, guest room closets, and laundry closets. 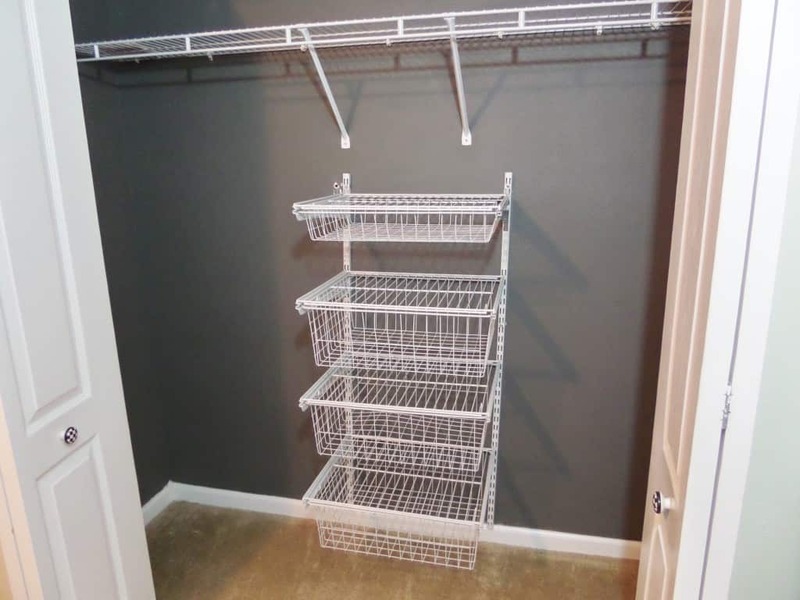 Storage Closets. If you are storing holiday décor, camping gear, or anything you use several times a year, it is important to go with a light, or ever white paint color inside the closet. This increases the visibility in the closet, especially with a glossier sheen, and makes the space feel cleaner and organized. If you are storing memboralia, photos, or even random items that you have stuffed in there, a darker color is more ideal because it preserves the items or hides the junk a little better. Guest Room Closets. There are two definite directions to go with these closets. You can go with a white interior to make the room seem cleaner or go with a darker color to make it more stylish. Depending on the room colors, you might feel like one option goes more naturally than another. This is one of the closets that there is more freedom of design here. Laundry Closets. The best paint color for a laundry room Is a lighter color, even white. This gives the space a cleaner feel, which is the entire purpose of the closet. Closets are a great space for you to get creative with your tastes. They are a critical part to each room, yet the color options have no set rules to guide you in your choices. Next time you walk by a closet, think about the pop of color it could provide or the color that could lighten it all up and make the space seem fresh and clean.